A copy of hand painted portrait of Samuel Haughton from Great Irish People website. Samuel Haughton, Irish scientific writer, the son of James Haughton (1795—1873), was born at Carlow on the 21st of December 1821. His father, the son of a Quaker, but himself a Unitarian, was an active philanthropist, a strong supporter of Father Theobald Mathew, a vegetarian, and an anti-slavery worker and writer. After a distinguished career in Trinity College, Dublin, Samuel was elected a fellow in 1844. He was ordained priest in 1847, but seldom preached. In 1851 he was appointed professor of geology in Trinity College, and this post he held for thirty years. He began the study of medicine in 1859, and in 1862 took the degree of M.D. in the university of Dublin. He was then made registrar of the Medical School, the status of which he did much to improve, and he represented the university on the General Medical Council from 1878 to 1896. He was elected F.R.S. in 1858, and in course of time Oxford conferred upon him the Hon. degree of D.C.L., and Cambridge and Edinburgh that of LL.D. He was a man of remarkable knowledge and ability, and he communicated papers on widely different subjects to various learned societies and scientific journals in London and Dublin. 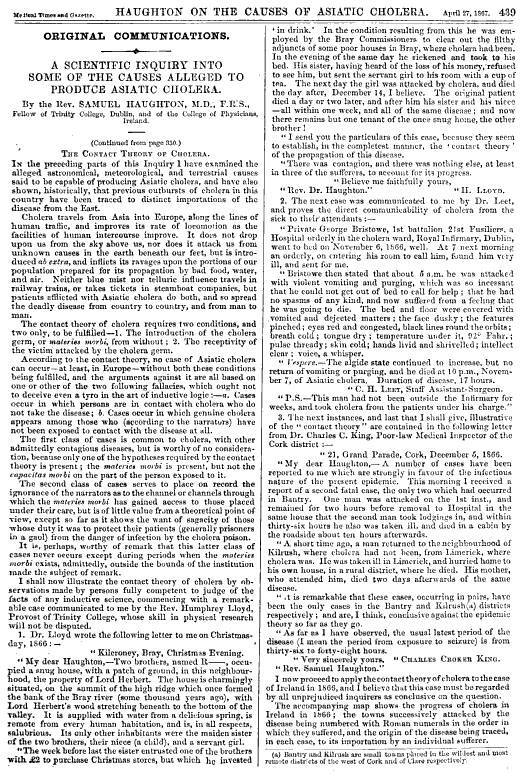 He wrote on the laws of equilibrium and motion of solid and fluid bodies (1846), on sun-heat, terrestrial radiation, geological climates and on tides. 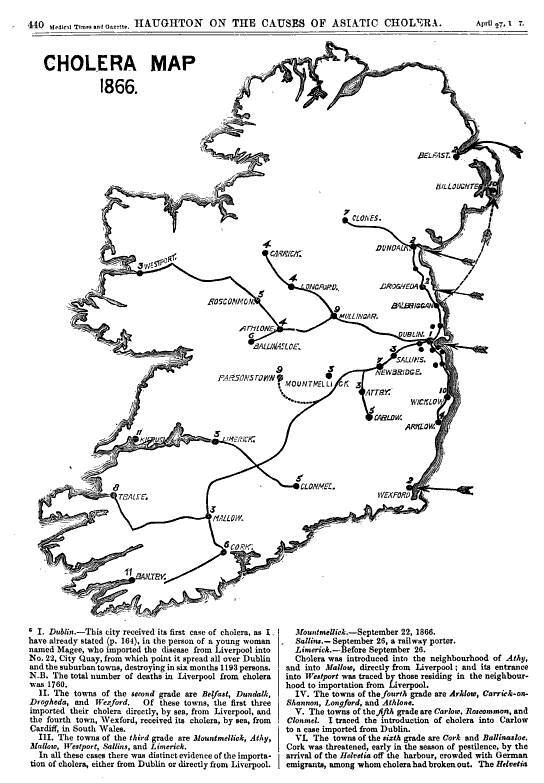 He wrote also on the granites of Leinster and Donegal. and on the cleavage and joint-planes in the Old Red Sandstone of Waterford (1857-1858). He was president of the Royal Irish Academy from 1886 to 1891, and for twenty years he was secretary of the Royal Zoological Society of Ireland. He died in Dublin on the 3rd of October 1897 at the age of seventy six. For more on Haughton: William Haughton & Dr. Richard E. Haughton : http://www.countyhistory.com/books/doc.fayet/477.htm. 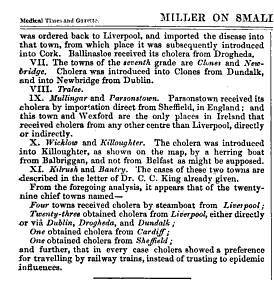 Dr. Haughton claims his map of cholera proves the contact theory of cholera. How does he define this theory based on the content of this article? Either hierarchical or non-hierarchical diffusion could be used to describe the paths depicted on this map. Argue both sides of this theory, select the most likely form of diffusion that took place, and then argue how additional details about the disease might help to support your argument (using sequent occupancy concepts, historical population data, documenting cases locally, times and data information, etc.). If possible, provide some real data of this area to further argue your conclusion.